We are passionate software developers and have been meeting the needs and desires of our industry customers for 30 years. Since the first individual solution with a global player in the automotive industry, we have accumulated a great deal of experience and with this know-how we have implemented numerous other custom-made software solutions for well-known production companies. Outstanding projects were the creation of a KPI management system (30,000 accesses per month!) and that of a supplier and parts management system (a booking every 2.5 seconds!). A solution for calculating performance wages based on production data acquisition has been implemented for a supplier. 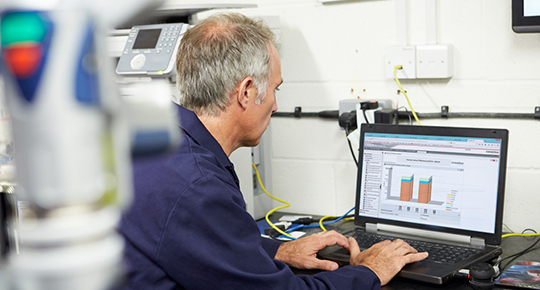 Most recently, an individual tool management system was created for the same customer. With this program, tool costs are monitored and implementations as well as repairs including expenses are planned and documented. Of course, the development of our standardized software packages also benefited from the knowledge gained from customer-specific projects. Nevertheless, custom development remains an important part of our business. Since then, some solutions have been incorporated into our standard software at customer’s request. Other solutions continue to be used by only one company and are thus perfectly matched to its processes and requirements. The requirements of Industry 4.0 and the individuality of companies today increase the necessity of developing software solutions according to customer wishes as the market standard doesn’t cover the function sufficiently. 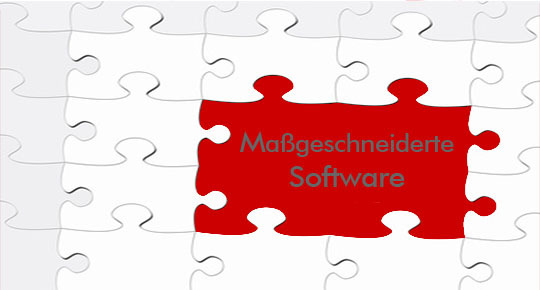 The requirements of Industry 4.0 for software development are also always met with individual programming. Our developers and project managers are familiar with the requirements of an industrial operation and comprehend even complex and multi-layered requirements. The numerous experiences from past projects in the manufacturing industry adds additional input to your task and prevents expensive mistakes. With our experience, we ensure the best possible implementation and avoid long maturation processes of software functionality, as is often the case otherwise. As a foundation for programming, we use prepared and proven software components, where appropriate, and touch down on them when implementing your requirements. These building blocks already are a proven system in and of themselves. Another effect of this is that your software remains easily expandable if needed. If required, updates can also be brought in to ensure that your system will continue to adapt to changes in your IT landscape in the future. Furthermore, it shouldn’t be ignored that our components have been expertly demanded by thousands of users for 30 years. Such a maturity can not be achieved with a pure new development. Your requirements go beyond the functions of standard software. You only require a limited part of the complex scope of standard software available. You do not want to overly configure your solution, but rather you need software that is ready-to-use tailored to your needs and processes. Your own look and feel should be implemented into the software functions. Your software solution should provide a competitive advantage that your competitors have no access to. You must close functional gaps in your software landscape. You want to provide existing software functionality for your newly created Industry 4.0 environment in a technically modernized form. Your requirements for software support in production are analyzed by our experts and an implementation proposal (concept) is prepared. This way, you gain an objective decision-making support for a project with us.